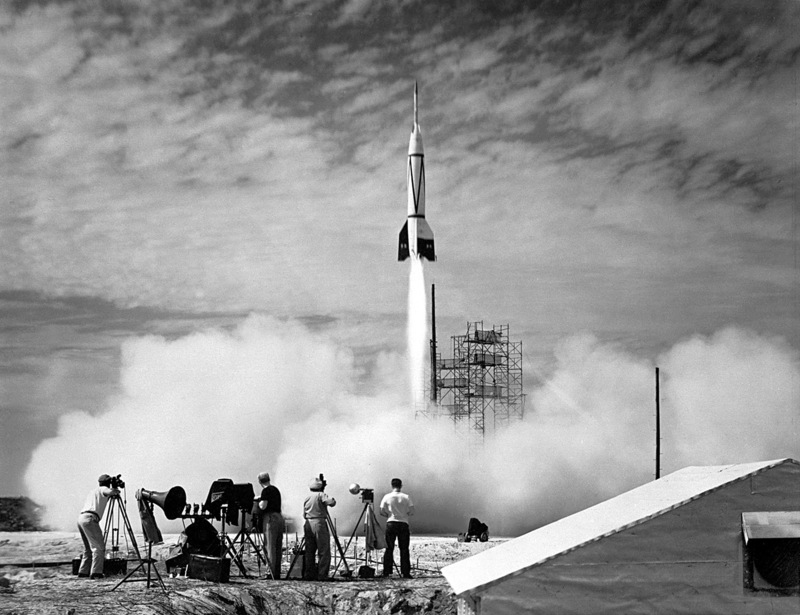 Explanation: A new chapter in space flight began on 1950 July with the launch of the first rocket from Cape Canaveral, Florida: the Bumper V-2. Shown above, the Bumper V-2 was an ambitious two-stage rocket program that topped a V-2 missile base with a WAC Corporal rocket. The upper stage was able to reach then-record altitudes of almost 400 kilometers, higher than even modern Space Shuttles fly today. Launched under the direction of the General Electric Company, the Bumper V-2 was used primarily for testing rocket systems and for research on the upper atmosphere. Bumper V-2 rockets carried small payloads that allowed them to measure attributes including air temperature and cosmic ray impacts. Seven years later, the Soviet Union launched Sputnik I and Sputnik II, the first satellites into Earth orbit. In response in 1958, 50 years ago today, the US created NASA.